Released only days before “The Tramp,” this Essanay comedy starring Charlie Chaplin seems to show him starting to get his bearings after a few middling efforts at the new studio. While it may not – quite – be classic on the same level as the better-known release, it definitely shows both his developing directorial talents and his natural comedic ability. Frequent co-star Edna Purviance is in a quandary. Her father is determined to marry her to an impoverished French nobleman (who appears in the Intertitles as “Count Chloride du Lime” or sometimes “de Lime”). She secretly loves Charlie, though it is unclear how the two met, and requests him to “rescue” her. He immediately goes to the front door and tells the butler to announce him as the Count! This is enough to get him a free drink and an opportunity to swipe cigars, and then the father invites him to dine with him and his daughter. At this point things start going wrong. Charlie clearly lacks the social graces, accidentally puts a sugar cube in his soup, eats beans off the edge of his knife, and has a very difficult time cutting his meat. As coffee is served, the “real” Count (who looks every bit the imposter as well) turns up, and the father angrily turns Charlie out. The Count takes Edna out to the park to try to woo her despite her obvious lack of enthusiasm, and Charlie finds them there. A slapstick running battle now breaks out, involving Charlie, the Count, Edna’s father, and two dopey policemen who jump out of the bushes at a comic moment. Having emerged more or less victorious, Charlie takes Edna down to the road and makes off with her and the Count’s car (the “Jitney” of the title). The father and Count pursue in another vehicle, and another madcap chase begins. It ends with one car going into the Bay, and the lovers kissing discreetly in the land-bound survivor. This movie was shot in San Francisco, and the park used is recognizably Golden Gate. During the car chase, anyone who has been to the beach at Golden Gate will recognize the windmills seen in the background of the car chase. What’s more fascinating is the dirt roads, apparently in that same vicinity, and the paucity of buildings alongside them. This is less than ten years after the 1906 Earthquake, of course, but I don’t think the under-developed look is due to lack of reconstruction. It appears that the area was still sparsely populated at this time. The Jitney is today mostly associated with early motorized taxicab operations, but this one appears to belong to the Count as a personal-use vehicle. Much of the humor of the chase comes from Charlie’s needing to get out and crank it up every now and again. 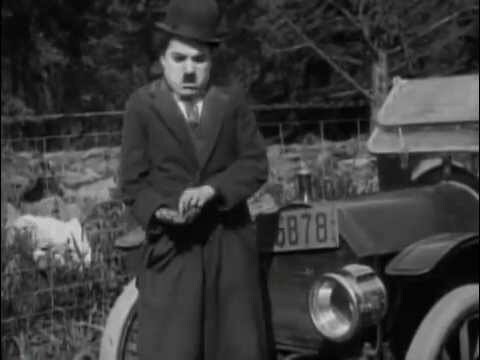 Technically, the movie again confirms the development of Chaplin’s standards after he left Keystone studios. The camera is frequently placed much closer, so that the audience can plainly see Charlie’s and the other actor’s faces, not necessarily their full bodies. In fact, the camera is closer throughout much of this movie than in “The Birth of a Nation” or other 1915 movies praised for their innovations. The editing is also particularly good, and keeps the high speed chase working well. Cutaways sometimes make use of reaction shots, as when the two cops attempt to stop the Jitney by holding a rope across its path and are dragged behind it. We see most of this through Charlie’s reactions, only catching the beginning and end of the action. The scene of the dinner reminds me of gags Charlie would use later, for example in “The Gold Rush” (there are no dancing bread rolls, however). Edna isn’t quite up to Mabel Normand’s level as a leading lady, for me, though. She mostly looks on as Charlie and her father fight, and only seems to follow Charlie’s lead rather than taking action for herself.